Wednesday Camp Notes: Tides Changing? Suddenly, the race for the Twins fifth starter job has gotten rather interesting. Three weeks after Paul Molitor said it would take “something fairly significant” for Tyler Duffey to miss out on a rotation spot, the right-hander has a 6.48 ERA through three Grapefruit starts, and he got shelled on the minor-league side today. Meanwhile, Ricky Nolasco cruised through six scoreless innings against the Rays at Hammond. * It’s hard to say whether these coinciding events could be construed as “significant.” No one puts much stock into results on the minor-league fields, and Nolasco was facing a Rays lineup that was beyond watered down, since the team flew back from an exhibition in Cuba last night. Still, the big curve ball from Nolasco that drew rave reviews during his last outing was on full display today. He got more than half of his seven strikeouts with the hook, and said he thought his slider was even better. Of course, breaking balls have always been a strength for the 33-year-old. He claims the big difference-maker today was his fastball command. And as for his status in the rotation competition? "It’s not my decision. I’ll leave it up to those guys ... They know how I feel. We’ll see what happens." * Is there any scenario in which Paul Molitor would consider bringing Duffey, a former college closer, north as a reliever if Nolasco and Tommy Milone end up in the last two rotation spots? "I haven't really thought about that as an option for the circumstances that we're looking at," the manager said. * Molitor confirmed after the game that Ervin Santana will be the team’s starter on Opening Day, with Kyle Gibson and Phil Hughes following him in Baltimore. That lines up Gibson to pitch the home opener against the White Sox at Target Field on April 11th. I wrote about Santana setting a tone for the rotation earlier this week. 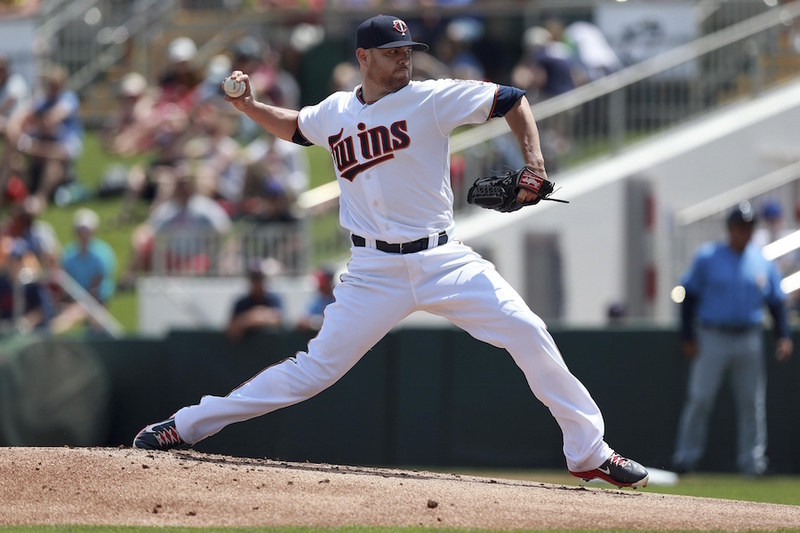 * The Twins announced during the game that they had outrighted lefty Mike Strong from the 40-man roster, creating an opening that will likely be filled by non-roster invite Fernando Abad. The veteran Abad was always likely to win a bullpen spot, and it looks like he’s had a solid enough spring to lock it up. * Danny Santana was in the lineup at second base today, after starting at shortstop on Tuesday and in center field on Monday. Molitor said earlier this week that he’s trying to get a gauge on Santana’s capacity to serve in a utility role. The general manager likes what Santana brings to the table as a bench piece. * The Twins cut six from camp this morning, trimming the total number of remaining players to 37. I wrote up a quick article about what the cuts – which included one reliever who was in the bullpen for all of 2015 – mean for the bullpen competition. * Daniel Palka raised some eyebrows by hitting a pair of home runs when he traveled to Clearwater with the split-squad on Tuesday, including a mammoth blast that he pulled over the right field wall. Today, while playing with the Triple-A group in the game Duffey started, Palka hit another bomb, this time an opposite-field shot. The pop this spring has been as advertised from Palka, who has hit 51 home runs over the last two years between two levels of A-ball. Acquired in exchange for Chris Herrmann in the offseason, the 24-year-old is looking like a nice find, infusing more power into a system that is suddenly rather flush with it. It would not surprise me to see Duffey starting at AAA. He's been struggling. I just hope if Nolasco gets a starting rotation spot he's on a VERY short leash. They are worried about Santana's positional experience, but putting Sano in RF? that seems a bit inconsistent to me. I hope this game doesn't give Nolasco the starting spot. It was against a more than watered down team--basically 2nd tier minor leaguers. Nolasco needs to go. Again: they know that Sano in RF is not ideal. They just don't really have a choice. I still would have tried Joe in RF and Sano at 1st. I just believe that they won't mess with Joe at all. They had choices! But they were made 3 months ago! Besides when he wanted to stay at C and they move him to 1B. I've seen Nolasco's last two games. He does not need to go, and if you had seen them you'd agree. IMO he's winning the spot in the rotation thus far. If he can keep pitching like he has been he could win a lot of games this year. As opposed to the actual minor leaguers Duffey faced today? I was only watching on TV today, but Nolasco looked good. He was hitting his spots, good movement on the ball. I'm a huge Duffey fan, but so far, yikes. If you trust Molitor to make changes as necessary, I think Nolasco has to be the one to go north. If you don't trust the manager to put the best players on the team and make changes when that isn't the case, that's a different problem. Well, I'm sure the Twins would rather see Duffey start at Rochester than languish in the bullpen. That leaves a possible spot for O'ROurke to return. Still out: Arcia vs. Quentin. Of course, if the Twins would add Hicks or Mastro, they need to clear 40-man space. and the choice of getting Parks necessitated having to either move Plouffe in a trade or move Sano to the OF. They created the situation where they had no choice. The million dollar question is what 10 starts last year mean this year. While this is true that this combination does create some interesting lineups, especially early in the year, it is a nice problem. Having quality with quantity on the major league roster will never hurt a team. Gone are the days of running out Jason Tyner (I always enjoyed watching him though) and Phil Nevin types. In my opinion this is a much more preferable issue than which stopgap/reclaim guy we can plug in. It is also absurd to expect the same lineup all throughout the season; rosters are fluid. The FO has put themselves in a position to plug holes with quality and youth in literally every spot in the order. There was always a decent chance Duffey was going to be a flash in the pan. Twins' rotations have been absolutely plagued by pretenders that have limited success and can't make any adjustments when the league catches up (Deduno, Pino.). He doesn't have any sort of track record to make you think it isn't the case here too. Not saying I have any faith in Rocky Nabisco but Duffey has a long way to go before people should be assuming he's going to resemble a major league quality starter for any extended period of time. It was unrealistic to expect Duffey to take off from his 2015. He was always going to regress. I expected Nolasco to take the spot "reserved" for Duffey in the rotation. This just gives the Twins more reason to do that. In my opinion this is a much more preferable issue than which stopgap/reclaim guy we can plug in. Except the player who is getting squeezed out, at least for now, is Max Kepler.. who is far from a "stopgap"
A lot of talk about D. Santana and his versatility, where does this leave Nunez?? Who is the primary infield backup?? Who starts when Dozier or Escobar gets a day off? I think if Santana could hit like Sano, they wouldn't be too worried ! Both players lack positional experience, and both players are being counted on to adequately fill their roles. Not sure what could be more consistent than that. This is my biggest complaint about the Sano to RF experiment. If Kepler is as good a prospect as most believe here, it doesn't make much sense to have 24-year old Eddie Rosario and 22-year old Buxton and Sano manning the outfield. First base and DH aren't optimum for Kepler and the Twins have two guys committed for the next three years at those positions anyway. Kepler is also a high obp, left handed hitter that would fit in the upper half of this lineup so well. Yup. Like Danny Santana of last year, Duffey would be far and away #1 on my list of regression candidates for the Twins this year. He's without a doubt been the best RP to SP conversion from the draft the Twins have accomplished, but I think if it were a true competition, Nolasco and Milone would be winning it. If Duffey did lose a rotation spot, I wouldn't hesitate to pull a Trevor May on him, though. I completely agree, I am very bullish about his major league prospects; just not this year. He looks like an excellent player who isn't reliant only on BA or SLG to have value. Unfortunately he has only shown this for literally one year, in the minors. He is 23, has never had extended playing time above double A and while he would be a better RF to start out than Sano, he is not a player that can survive on his defense alone. I have no problem with him getting more seasoning in the minor this year and I think that Kepler in the minors for NOW puts the Twins in the best position to win. → Article: Wednesday Camp Notes: Tides Changing?